Dry is the operative work here on the mountain right now. A Christmas fern that has lived for years in the crack of a boulder near the cabin is drying and turning brown. 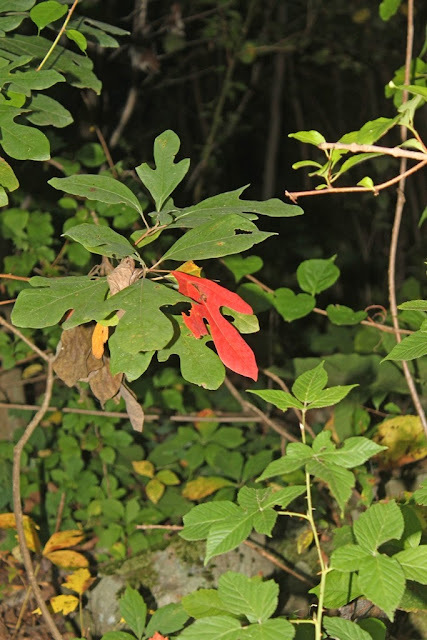 Now, even the leaves on mid-sized trees are drying up. I think the word for the autumn leaf change here will be “brown” this year. I’m not expecting pretty reds or yellows anymore. I watered the fern in the boulder this morning, which seems a tad ridiculous, even to me. All the plants on the forest floor are withering, and I water a fern in a boulder, which has held on to life despite little soil for it. But I like that fern and would hate to see it disappear, so I watered it. I don’t know if it will do any good. It may well be a matter of too little, too late. Acorns are dropping all around my cabin, sometimes on my cabin, which makes a heck of a racket, frequently causing Baby Dog to bark at the perceived intruder.. I think it is those acorns that keep the deer so close to the cabin. I scare one or the other of them almost every time I set foot outside. And if I go back inside even momentarily, the deer are back where they were when I scared them the first time. They don’t seem to mind being startled multiple times a day. Sometimes they don’t even move away at all. I wonder if that will change when deer season starts. This year I’m finding lots of yellow wooly bear caterpillars. The particular species I’ve been seeing is probably a sycamore tussock moth. It can only be told from the banded tussock moth by dissection, though the range of the banded tussock moth seems too much a southern species to be found at my cabin, even in these days of climate change. Since I’m not planning to dissect any of these, let’s just call them tussock moths of some species. They are far prettier as caterpillars than as moths, anyway. Can I let a month go by without posting a photo of a nice sunrise? Why would I even want to let that happen? Here, we are right at the end one month and nearly on the heels of the next, so if I’m going to post a nice sunrise photo, it had better be today. The three deer that live around the cabin grow ever less wary. I might scare them off when I walk into the drive after a walk with Baby Dog, but once I put her inside and then go out to feed the chickens, there they are again. 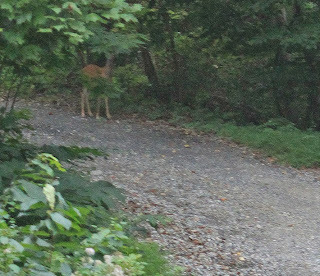 Last night a large doe “tip-toed” across the driveway behind me. I only saw her when I just happened to turn around. She wasn’t in any hurry. This morning the same doe and her now-spotless fawn were munching grass in my neighbor’s boulder-sized yard. Sometimes I see them by his boat or his grill. Sometimes they are by my back steps. They are sneaky and apparently don’t mind at all being within hearing distance of televisions, outdoor cellphone conversations or me working around the cabin. They are happing to ignore me as long as I pretend not to notice them. They don’t much like being looked at. Perhaps they will grow more wary when the forest’s summer vegetation is completely gone. For now, they are almost underfoot. Even on a perfectly clear morning, as this one is, the later sunrise keeps me from taking photos in the forest. When I leave the mountain in the mornings, sunlight still hasn’t penetrated down to the ground, though the tops of the tallest trees are still bathed in morning’s light. So I will have to begin taking evening photos again, in order to take photos in the forest now. Remembering to do that always takes me some time. I’ve gotten used to taking morning photos, and I prefer doing that. A morning photo means the daily writing topic for Roundtop Ruminations and the day’s photo may have some relation to each other. With an evening photo, that’s less likely. And this switch from morning to evening photos is a sign that it won’t be long before all my blog photos will need to be taken on the weekends, as it will be dark when I leave the cabin and dark when I return to the cabin during the week. Those are not my favorite times. Fortunately, those days are still weeks away. On this early day of fall, the season already feels well-started. Here on Roundtop, the deer are wearing their brown winter coats. The fawns have lost or are losing their spots. The summer songbirds are gone, and the local residents are noisy again now that the breeding season is over. The mornings are crisp but the afternoons are warm enough to roll up my long sleeves as I putter around the cabin. The forest's summer understory is withering and and disappearing onto the ground. it is not yet cold enough, not the days short enough, for the big trees of the forest to turn color, but the drying of leaves on the smaller trees continues. At the moment, the trees most affect are the smaller tulip poplars, a softwood. The big tulip poplars are as green as ever. August and September so far have been cooler than normal here and also drier, if not by an enormous amount. I have occasionally before this year seen early yellowing on leaves. Typically, that has occurred when August is both hot and dry, so I am surprised to see it happen during a cool and dry season. To my eye and memory, the level of this year's drying leaves is extreme. At the moment, precipitation is not quite 4.5 inches below normal, a goodly, if not extreme amount. I am thinking that the lessened amount of snowfall last winter and the drier than average spring did more damage to the smaller trees than could be made up by a rainy June. perhaps these smaller and less robust trees were made even less robust by the wet weather of 2012. And while 2012 was only about 4 inches above normal in my area, 2011 was a record-setting wet year, nearly double the normal precipitation. So now in a dry year, these trees aren't perhaps as hardy as they might have been if rainfall had been "normal" over their growing lives. 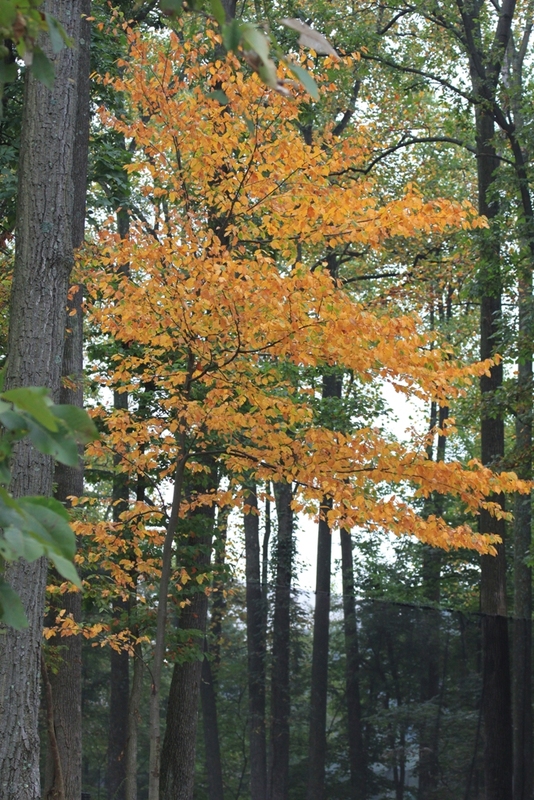 It is well known that a warm, dry summer followed by a rainy autumn produces the best fall colors. We've had the dry part, and the summer was warm, though not hot. 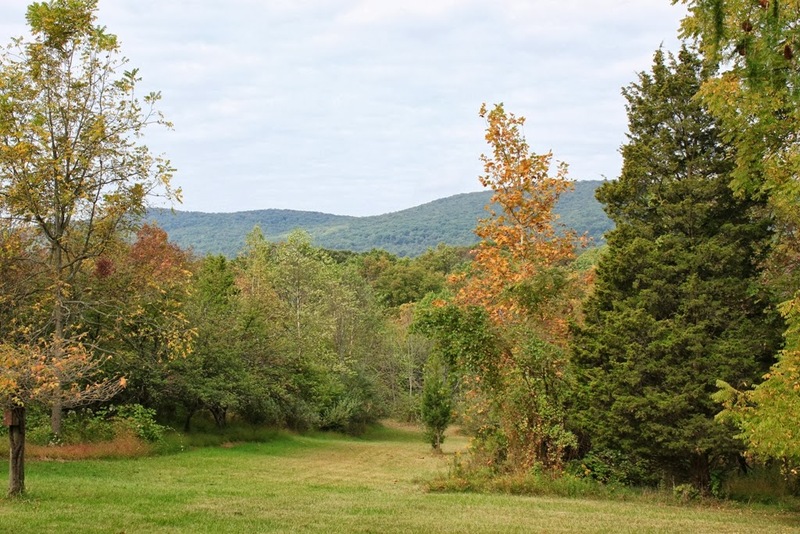 Now, if only the rainy autumn would appear, perhaps this would be a good year for fall colors. That is something to look forward to and hope for. Hawkwatchers are not just hawk geeks. We tend to be nature geeks as well. If the hawks aren’t flying, we’ll look at any other birds that are around the hawkwatch. Most hawkwatchers are good birders, too. If the birds aren’t flying, we’ll look at animals or plants or clouds. Even on days with good flights of hawks, there are times when none are in the air. 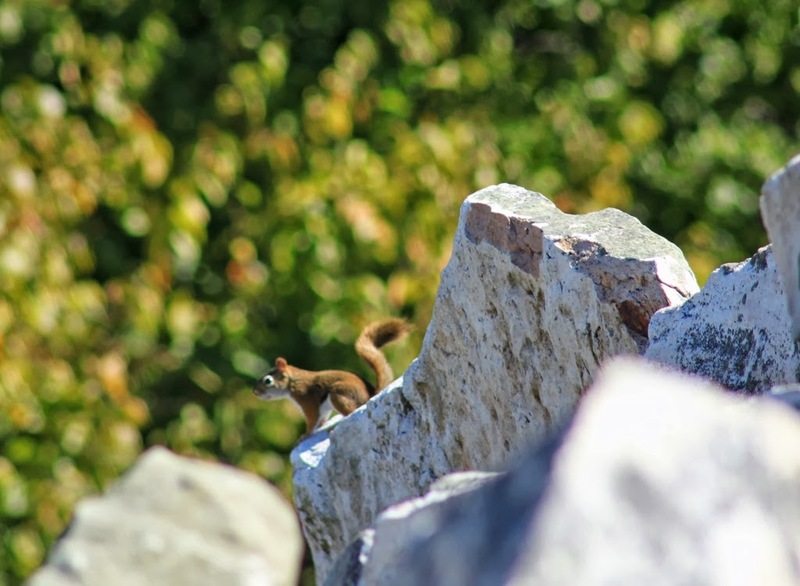 The past few days at Waggoner’s Gap hawkwatch had a nice selection of animals to look out. I was a bit disappointed that Fred the Copperhead didn’t make an appearance, but I guess you can’t have everything. One of the highlights was a Waggoner’s first, at least so far as any one there knew or could remember. 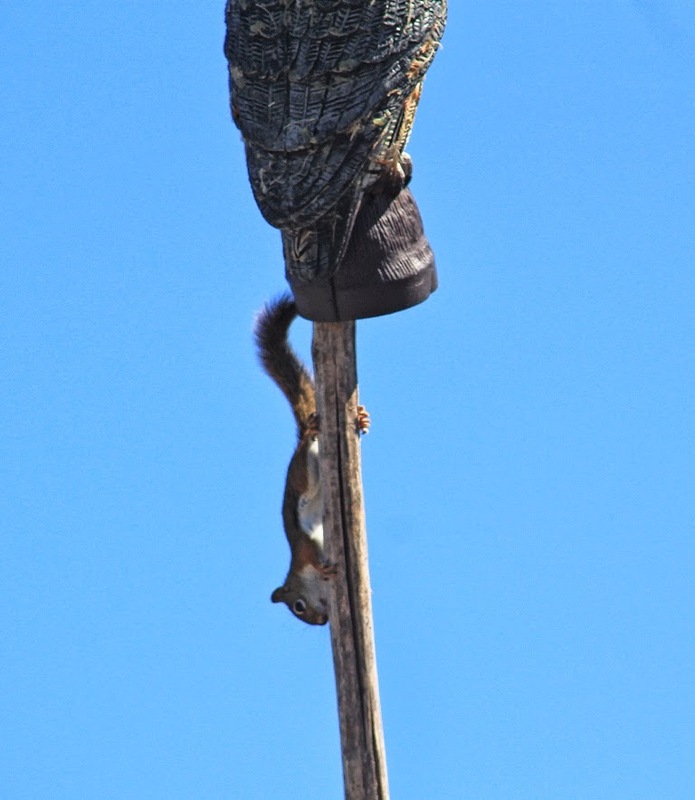 A young red squirrel ran up the owl pole, stuck its head in the bottom of the decoy and then ambled down the pole, nearly running over someone’s feet and hanging out on a rock for a minute or two. The owl decoy is used to attract Sharp-shinned Hawks closer to the ridge. They are feisty little things and sometimes just have to swoop at the owl decoy, to the delight of all. Other but more frequent visitors are the chipmunks. They are lured by one of the regular hawkwatchers who brings chestnuts or peanuts or something that chipmunks like and places the food on one of the few flat rocks on the outcropping. 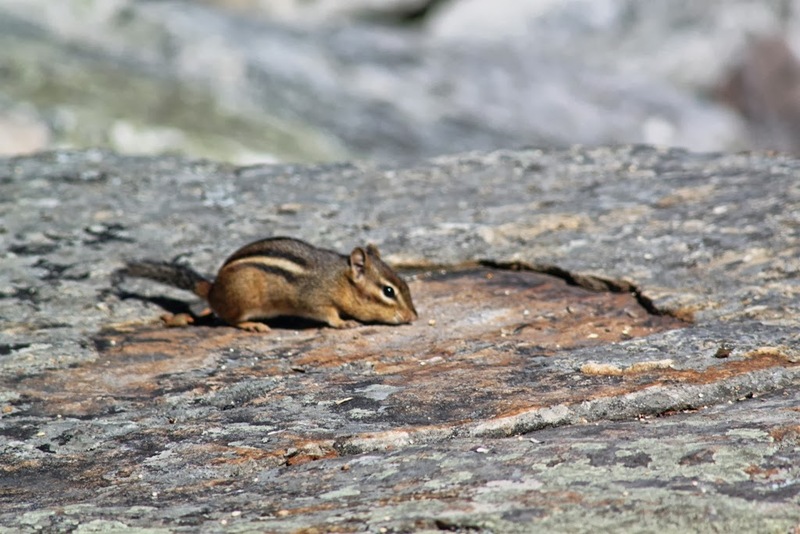 The chipmunks scamper through the rocks, used to people, chasing each other and filling up their cheeks until they look as though they have mumps. Another visitor wasn’t a mammal, but was worth looking at, too. It is an eastern fence lizard, and it came out to sun itself for a while. 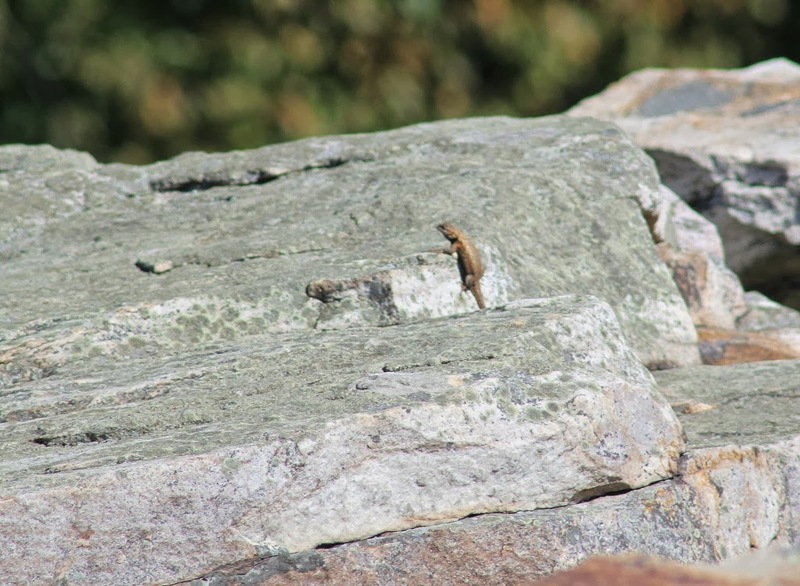 I’m told three species of lizards are seen on the mountain, but this is the only one of those I’ve ever seen. There’s always something to look at on a hawkwatch. It’s not always the hawks. Vacation is over and so is my extended hawkwatching. Now, I’ll have to be content with hawkwatching on Sundays and hoping the weather cooperates. (The weather won’t cooperate this Sunday, I’m afraid). The hawkwatching over the past five days was excellent, even though Waggoner’s Gap didn’t get a big Broad-winged Hawk flight (Yet. Friday could still be outstanding) . 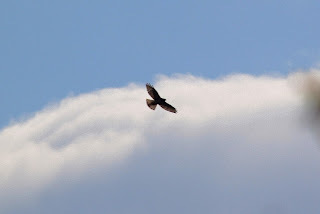 I still saw several thousand Broad-winged Hawks, but the big flight this year was seen at Mt. 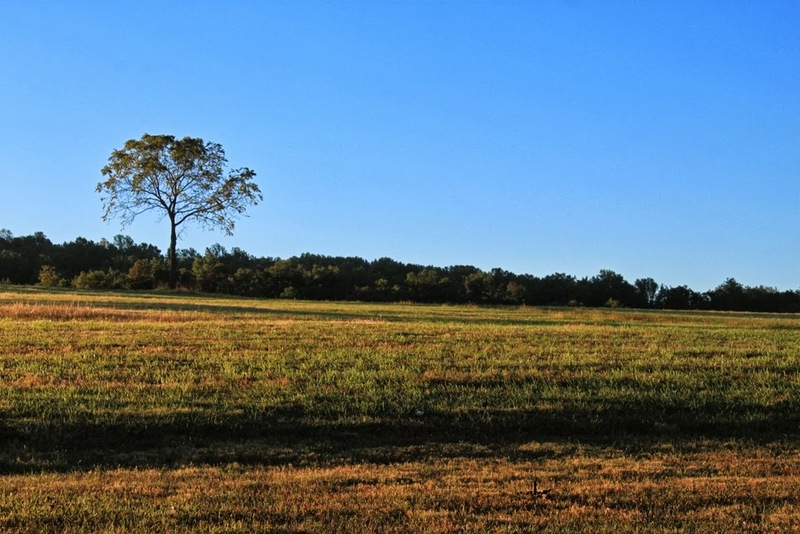 Wachusetts in MA and at Militia Hill, near Valley Forge PA, where they recorded over 18,500 on September 14. Don’t think I’m complaining, as I’m not. Typically, Waggoner’s Gap isn’t a premiere Broadwing spot. Eagles are the main attraction, though it’s still too early for Golden Eagles. So I saw Bald Eagles on this trip, probably about 40 of them over five days, with one day of 15. I also saw at least one of every raptor species that flies at this time of year. That means I saw a nice young Peregrine Falcon, a couple of Merlins, a few American Kestrels, Sharp-shinned Hawks, Cooper’s Hawks, a few Red-shouldered Hawks, Ospreys and a few Northern Harriers. Some non-raptors also appeared, including Ravens, another favorite of mine. We also saw a red-eyed vireo still feeding two of this year’s young. It seems awfully late for that, but there it was. In another month or so the mix of species will change and eventually the Northern Goshawks, Golden Eagles, perhaps the Rough-legged Hawks will be in evidence. Golden Eagles fly in large numbers, sometimes more than 100 in a season. Catching the goshawks or the roughies is less certain, especially recently. I got to renew acquaintances with hawkwatching friends and actually got to meet one person I’d only ever emailed before, though we’ve been emailing for some years. That was neat. The weather cooperated, if you don’t count the morning it was so cold and windy on those exposed rocks that we all wore long underwear and layers of jackets. I was just glad I had a pair of gloves in my car that I hadn’t put away after last winter. Waggoner’s Gap is high and exposed to the wind for 50 miles in just about any direction. 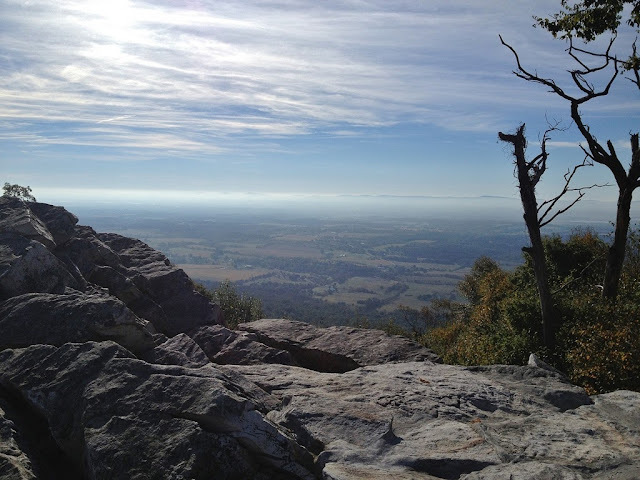 Weather down in the valley bears little resemblance to what you might experience on those rocks. It’s always best to be prepared with both sunscreen and a heavy jacket. Often, you need both at the same time. I've gone hawkwatching both yesterday and today (Sunday). Saturday morning was spectacular, with 500 hawks, mostly Broad-winged Hawks by noon. We also had 15 Bald Eagles by noontime. Then the flight pretty much died for the rest of the day. Today was nearly a repeat of yesterday afternoon, but with more Cooper's Hawks, a few very far out and distant Bald Eagles and several Broad-winged Hawks. That's the way of hawkwatching--feast or famine, sometimes all in the same hour. Monday? It's anyone's guess, but I'm expecting a decent day. At first glance, this photo doesn’t look all that unusual, but I think it is. First off, notice the green forest surrounding the woods road. 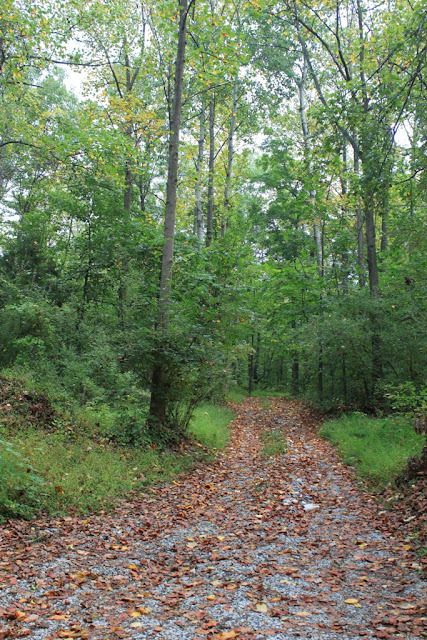 And then look at the woods road itself. Those are fresh, yellowed and dead leaves on the road. So the road looks like fall while the trees are still green. That’s the unusual part. The downed leaves fell during yesterday’s rather violent thunderstorm. 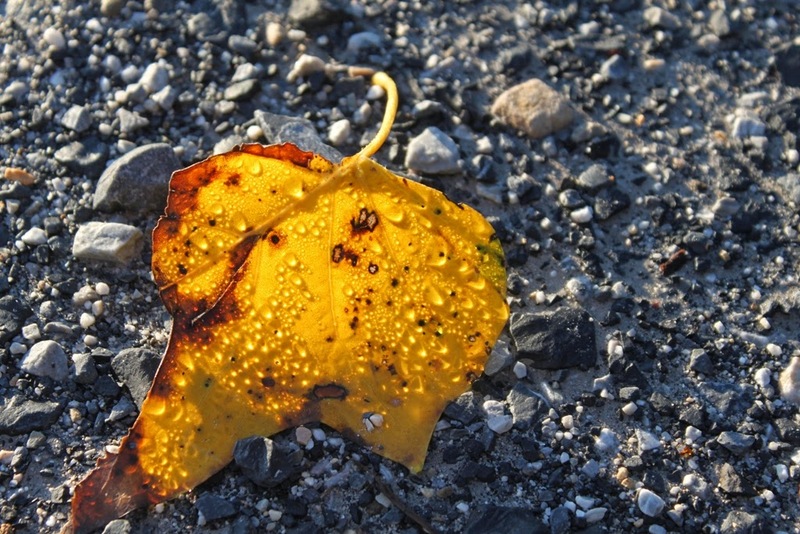 The leaves from the orange tree I posted earlier this week are among those on the ground. 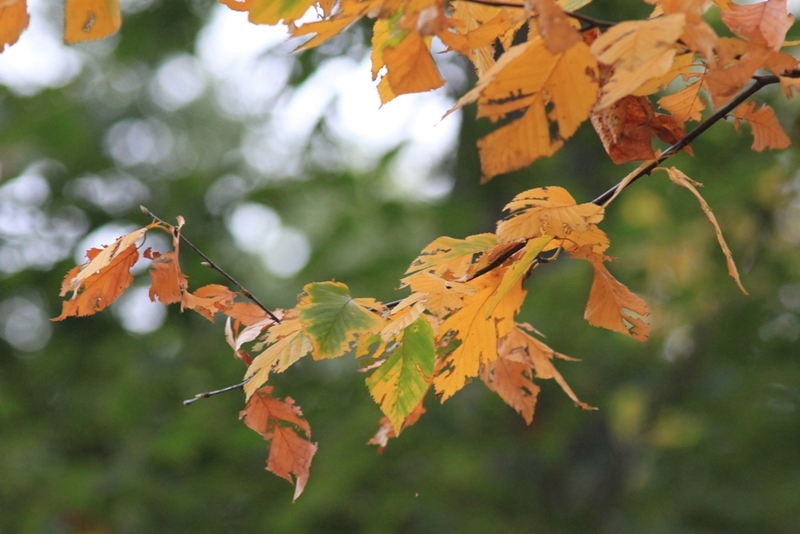 The trees whose leaves were prematurely drying or changing color are now closer to being bare than leafed out. Even in this photo you can see some color on the trees near the center of the photo. And those aren't on little trees. I have seen similar results before in September. In those years, a very dry and very hot August caused a lot of the smaller trees to drop their leaves early. This year August was drier than average but quite a bit cooler than usual. My area is several inches below normal in rainfall, but it’s not any worse than I’ve seen before and quite a bit better than in the worst years. So I’m wondering if this early September leaf drop is due to something else, though I don’t know what that is. Certainly the tinier plants are the forest floor are shriveling up, and I know it’s simply time for these mostly annual plants to finish their life cycles. Leaves on vines are also rolling up and will soon shrivel, despite the quarter inch of rain I got yesterday. I have investigated, at least a little bit, the species of trees that are shedding their leaves to see if I can find a pattern there. Beech trees are fairly prevalent among these and also wild cherry. The larger trees, like the oaks, tulip poplars and hickories, don’t seem much represented. So my best guess at this time is that the lack of rainfall in the past three weeks has unduly stressed these smaller, softwood trees and caused them to drop their leaves early. I may well be wrong, of course, so I will keep investigating. This is definitely not my day. It started when the trash receptacles were gone. So here I am at 6 a.m. left with a week’s worth of garbage and no place to put them on the hottest day in two months. 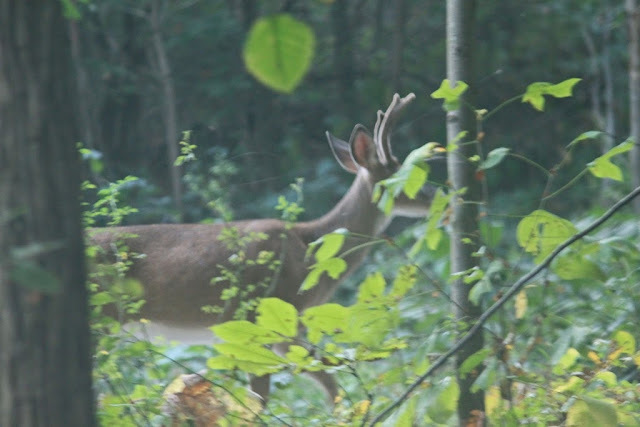 The day continued when I was leaving the cabin this morning and discovered a nice 4-point buck just a few feet away. And the auto focus on my camera focused on the vegetation in from of the buck instead of on the deer itself. At this point the deer was staring nicely at me and that would have made a great shot. But as you can see by this morning’s photo, the standing and looking part didn’t last, and the focusing part was never fully resolved either. And then I drove away from the cabin, located a nice American Kestrel atop a light pole in clear view, but by the time I stopped the car, rolled down the window and picked up my camera, Mrs. Nice Kestrel flew away. And then I managed to find a small flock of Cedar Waxwings, but the light was so poor and the birds were hiding atop the leaves on the trees that I didn’t get a usable shot of them either. And now I find that my work computer is giving up the ghost, but that I won’t be getting a replacement right away. I don't know what "not right away" means, but that doesn't sound very good either, does it? Maybe I should just go home and take a nap. That seems as though it should be safe enough. Summer is attempting to make a brief reappearance here on Roundtop mountain. And for two days the season will succeed, boosting temperatures to near-90. This brief moment of summer heat isn’t fooling anyone or anything, though. Broad-winged Hawks have started to fly south by the hundreds. Warblers are moving, too, and a few trees are even turning color. 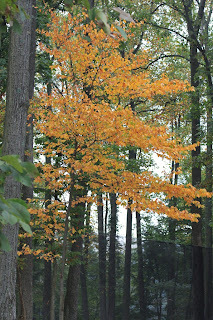 It’s true that most of the trees that are turning appear to be younger ones. Perhaps they are damaged or diseased in some way that’s not immediately visible. Perhaps their root systems are feeling the effects of a few weeks without any rainfall. But whatever the cause, the leaves are turning yellow or orange, and as a result the forest is starting to show the shades of the impending autumn season. I love fall, so I am happy to see the change. I’m also happy because the color is a change from the unending greens of spring and summer. Now that most of the summer wildflowers are past their prime, I can enjoy the variation of color on a grander scale than the tiny wildflowers offer. I admit it was something of a shock to see the colors this weekend. My morning walks with Baby Dog are accomplished completely in the dark, now. And my evenings have been spent hurrying to finish one project or another at the cabin, so it wasn’t until this past weekend that I really noticed the yellowing trees. Hawkwatching season is starting to move into prime time now, which means I will be spending as much time as I can on a hawkwatch. 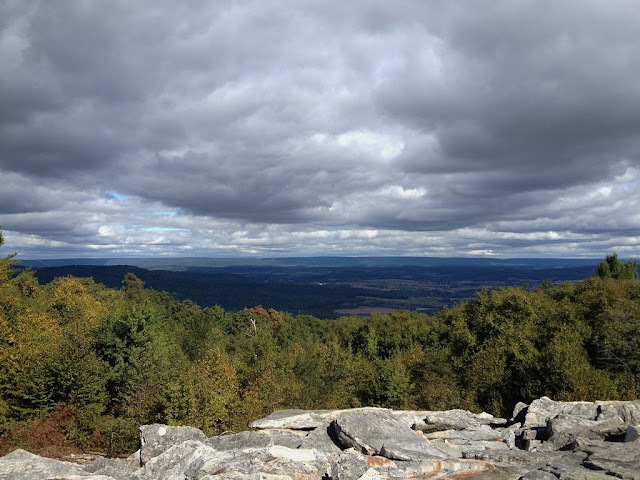 I usually go to Waggoner’s Gap, near Carlisle, PA, because it’s fairly close for me. It’s also a very good site, especially later in the fall for both Bald and Golden Eagles. 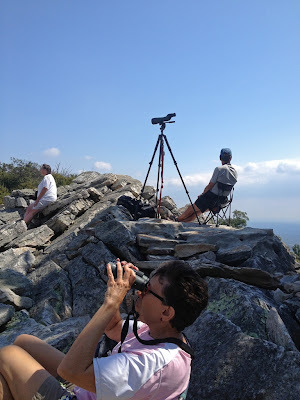 So on Sunday I found myself atop the mountain with Baby Dog and various other hawkwatchers looking for hawks. We had a very nice day, not as wonderful as the day before when I wasn’t there, but very nice even so. I saw Bald Eagles, Ospreys, Broad-winged Hawks, Sharp-shinned Hawks, a Cooper’s Hawk, Black and Turkey Vultures, Ravens, Cedar Waxwings and hundreds or thousands of Chimney Swifts, just to name a few of the species. Several Monarch butterflies were also seen, though no where near as many as is typical. That seems to be the case in many areas of the country, which are also reporting them in drastically reduced numbers. Three of the eagles we saw were interesting. All three migrated past within a minute of each other. All were on the same flight path and all were juvenile eagles, making us wonder if they were siblings. This was Baby Dog’s first trip to a hawkwatch and may well be her last. Most of the time she was well-behaved and slept through much of the day. However, she barked whenever anyone walked up the trail to the site, letting everyone know that “something” was coming. She didn’t bark when they left. And, if someone went to visit the port-a-potty a ways down the trail, she barked when they returned. Maybe hawkwatching just isn’t for her. While it is true that Orion can first be seen in the evenings in the fall, it makes its first appearance in a while in the early mornings. And if I’d get up in the middle of the night, I could have seen it weeks ago. Orion is really almost a circumpolar constellation. It vanishes into the sunset about May and is invisible during July and July. It’s up above the horizon still but hidden by the sun. It’s sometime in August when it coincides with night times, and it becomes visible again. To me it’s like meeting up with an old friend again. It’s a sure sign summer is on the wane. Now it’s time to think about preparing for the colder seasons—getting the fireplace checked, clearing off the decks, getting the air conditioner out of the window. Fall comes with a whole new set of chores, though I mind those less than the summer ones, primarily, I suspect, because it’s cool enough to accomplish them. I try to appreciate summer, and I’m better at it than I was, but it will never be a favorite season. 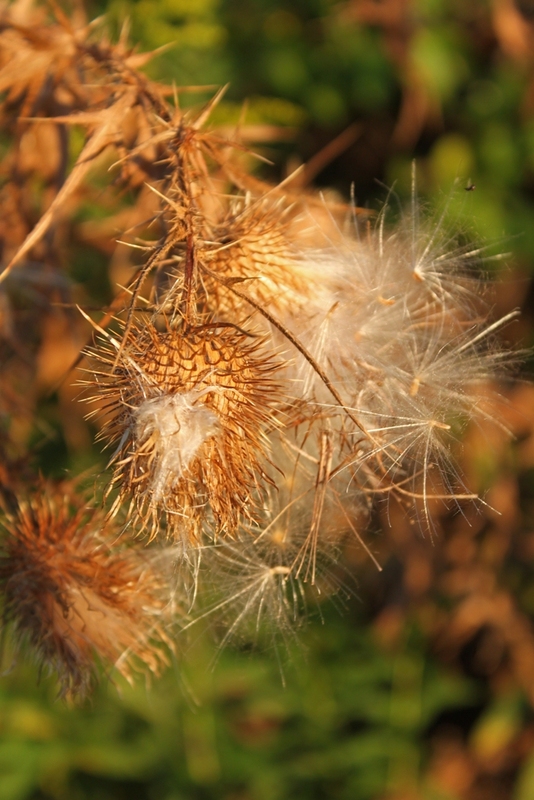 Most of the thistles around Roundtop still look like my first photo for today, but a few are already done. Those sport dry seed pods and dry leaves, finishing their season earlier than most of the other seasonal plants. 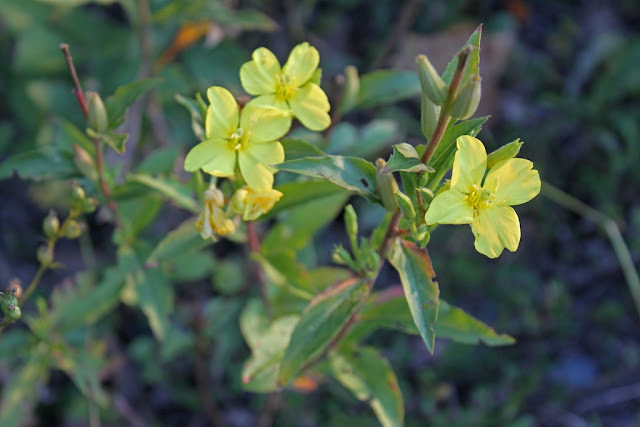 Gardeners hate this plant, of course, and it is an invasive species, as are so many in this country. I have a tough time hating it, partly because I think the flowers are pretty and partly because American goldfinch love it so much. Of course, I don’t have a yard or a garden where it encroaches. 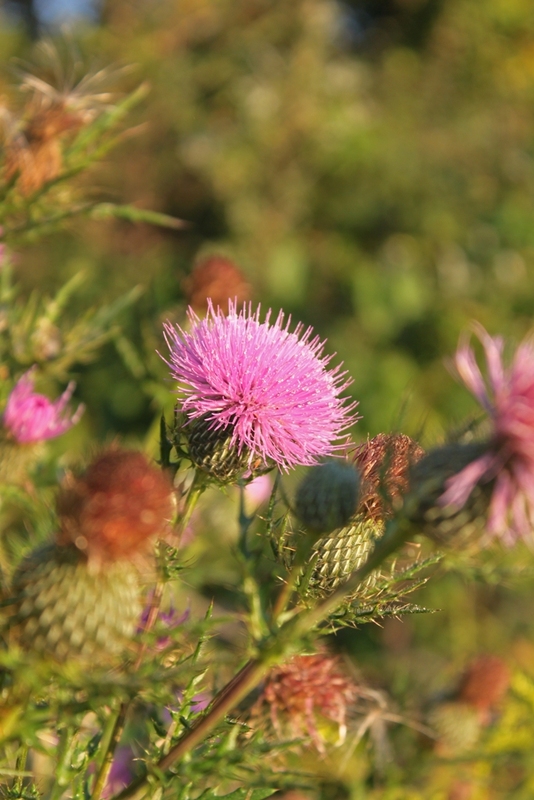 Canada thistle, as you might not guess, is really a native of Europe. It spreads both by seeds and through an extensive root system. I read recently that it doesn’t do well in higher temperatures or where the soil is rich. Perhaps climate change will eventually reduce its range. With the cooler, clearer nights, Baby Dog and I, well, mostly me though she enjoys coming along, have been star gazing this week. Now is a good time, with no moon to dim the night. Last night Cygnus the swan flew right through the middle of the Milky Way, a beautiful sight. Although I know most of the constellations, I don’t always know the stars that are in them. Recently, I found a free app called Sky Guide that I use when I am out. I just point my phone in the direction of the star or stars I want to know about and the guide shows me the same view, but with captions attached to both stars and constellations. It moves around when I do and is pegged to an individual’s location and the time of year, so each user sees only what is pertinent to them. Pretty cool. The mornings are now so dark when Baby Dog and I take our walk that I no longer hear any birds, not even crows or the early-rising pewees. Instead, we hear crickets and still a few cicadas. I need my headlamp nearly every step of the way, especially on a moonless morning. 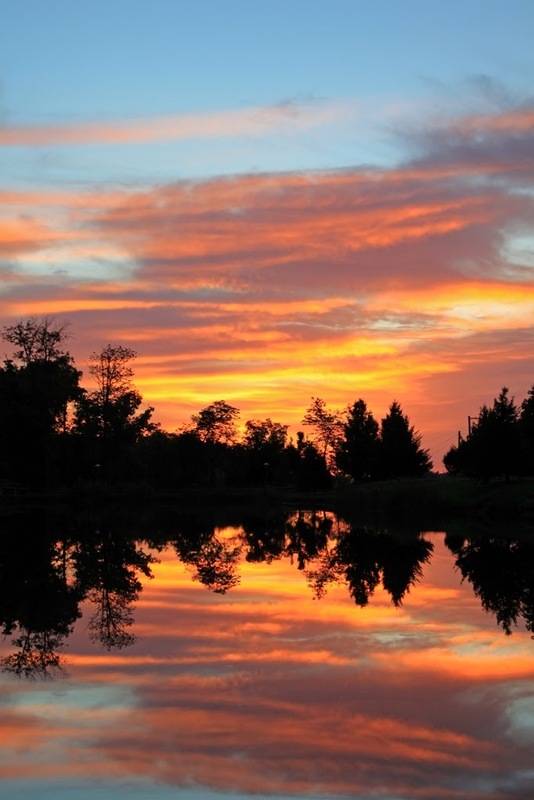 The eastern sky no longer holds any shade of yellow or orange, though I can see only the brighter stars. The air feels like fall, now that the humidity has been chased out by this past weekend’s storms. Some of the annual plants on the forest floor are yellowing, but the changes are not yet very far along. This morning I decided to take a photo of the mountain to my west, Nell’s Hill. The trees aren’t yet touched by fall colors, so now seemed a good time to show what it looks like before the color change progresses. I took the photo before the sun was well up, when the light hadn’t yet reached the base of the mountain. This weekend I will likely take my air conditioner out of the kitchen window and store it until next year. The weather forecast shows cooler temperatures through the next 10 days, and by then it’s unlikely the temperature will rise into the 90 degree range again. Summer’s strength is certainly broken, and fall is on its way. As summers go, this one held only a few weeks of truly unbearable weather, and that was in July. August 2013 was actually one of the cooler on record, the kind I only see once every decade or so. With the mornings dark again, my morning birdwatching has come to an end, at least on work days. I’ll have to be content with checking only in the evenings and on weekends. That’s a lot hard to get used to than the cooler temperatures! 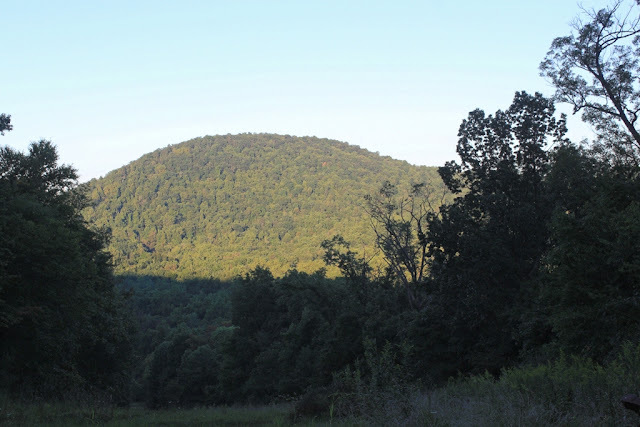 Chimney swifts by the hundreds are migrating past Roundtop Mtn. right now. I saw too many to count, especially given how they flit back and forth, high and low. Swifts are even more acrobatic than swallows, and during migration at least, they move in larger groups. The weather this past weekend was not conducive to much migration. Thunderstorm after thunderstorm rolled through, often several a day, each making the temperature hotter and the humidity higher—until the weekend was over, of course. Today is the kind of day when lots of birds will migrate. Higher pressure, a tailwind from the northwest, cooler air. Today would be a good day to be on a hawkwatch, and not only to watch hawks. Lots of species will move today. Even as poor as the weather was, I had several good sightings when I could be outdoors. The first was an adult Bald Eagle, not migrating, as it was headed north on Sunday morning. Bald Eagles are fairly common these days, especially along the Susquehanna River, but here on the mountain I can easily go several weeks without seeing one. The second sighting was better. I was sitting outside in my driveway, keeping an eye on my free-ranging chickens after the Cooper’s Hawk scare of last week. That’s when I spied a bit of flitting yellow in a tree above me. Even when I’m just watching the chickens, I take my binoculars with me. But even with my binoculars it took a while to see enough of this bird so that I could identify it. I had a yellow-throated vireo, one of those birds I see rarely and then only in migration. After watching it for a minute or so, it finally appeared on a bare twig long enough for me to tell what it was. The local deer have been out and about frequently this weekend, too. 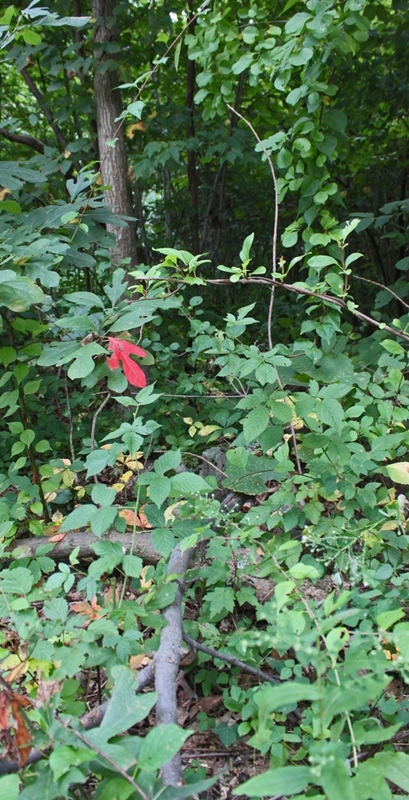 I was taking this photo of a red sassafras leaf, the only red leaf in the sea of green. When I was done I turned around and found a doe watching me take photos. She seemed more curious in what I was doing than scared. A day later, I found three deer in my driveway, one a fawn. I was feeding the chickens and when I finished and turned to go into the cabin, I found the deer at the end of my driveway, completely unimpressed by encountering me. Naturally, when I’m feeding the chickens, I don’t carry my good camera with me, though I did have the camera on my phone, so I used that. It makes them seem further away than they really were.